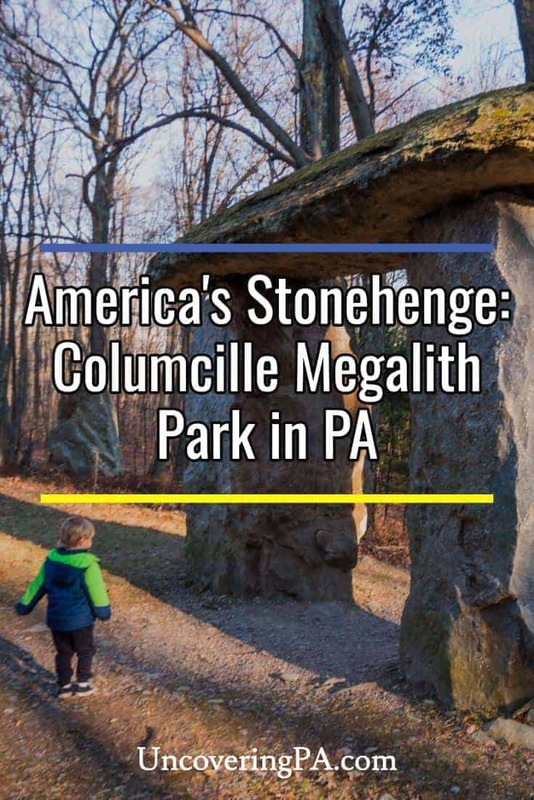 I’ve traveled all throughout Pennsylvania, and I’m not sure that I’ve visited many places that are seemingly more out of place than Columcille Megalith Park near Bangor, PA, in the very northern reaches of the Lehigh Valley. This privately-owned park features a series of large rocks that have been stacked in ways reminiscent of ancient Celtic practices. In fact, one of the highlights of the park is a series of rocks placed in a way reminiscent of a smaller Stonehenge. A Stonehenge-like rock circle near the entrance to the park. 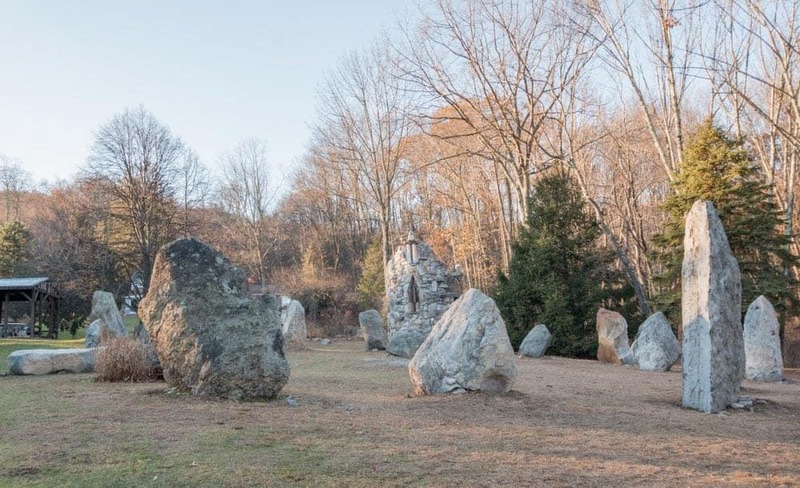 Columcille Megalith Park traces its roots back to 1967. It was during a trip to the Isle of Iona, a small island off the western coast of Scotland, that William H. Cohea, Jr. had a dream atop the island’s tallest mountain, Dun I. A stone gateway at Columcille. 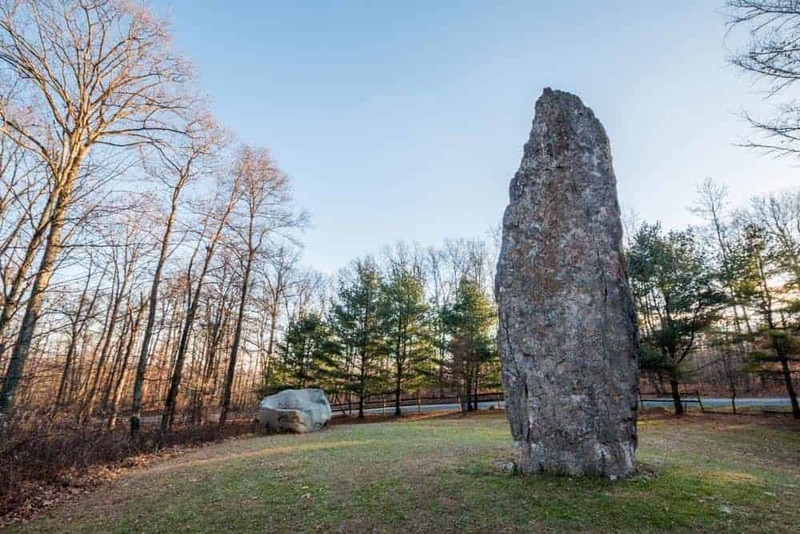 Moved by this dream, Cohea returned to the United States and, in 1975, purchased the land that would become Columcille Megalith Park. The name of the park comes from two places. St. Columcille was a 6th-century monk from Ireland. A contemporary of St. Patrick, St. Columcille built monasteries in Ireland before crossing to the deserted island of Iona and turning it into the foundation of Celtic Christianity. A Celtic eye that’s hidden away in the forests around the park. The second word, megalith, simply means a large stone that forms all or part of a prehistoric monument. In this way, the park honors the founder of Celtic Christianity and the prehistoric monuments the area is known for. Today, there are nearly 100 stone monuments around the park. These stones come from both the park itself as well as a shale quarry a few miles down the road. 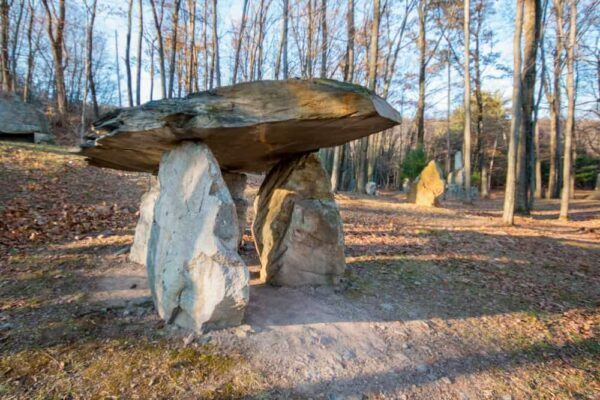 The stones range in size with the largest one rising 20 feet out of the ground and weighing roughly 45 tons! The stones at the park are up to 20 feet in height. The park features wooded hiking trails that pass between the 20 monuments in the park. 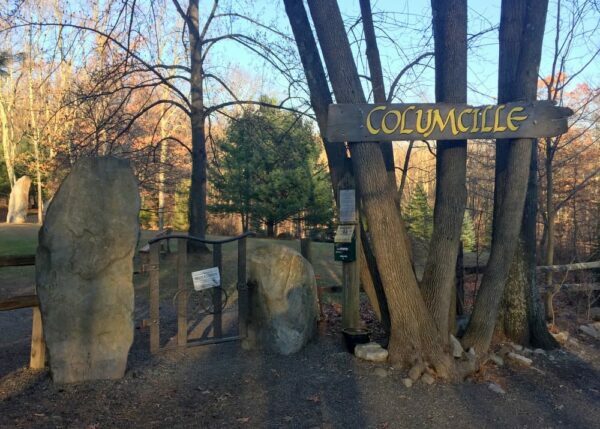 A map of Columcille Megalith Park is located near the entrance offers a bit of guidance of where to head, though with only a bit of detail. If you want to make sure you see as much of the park as possible, it might be a good idea to take a picture of this map to help guide your trip. However, if you are just looking to enjoy the beauty of the park and see what you come across, the hiking trails are easy enough to follow, though completely unmarked. 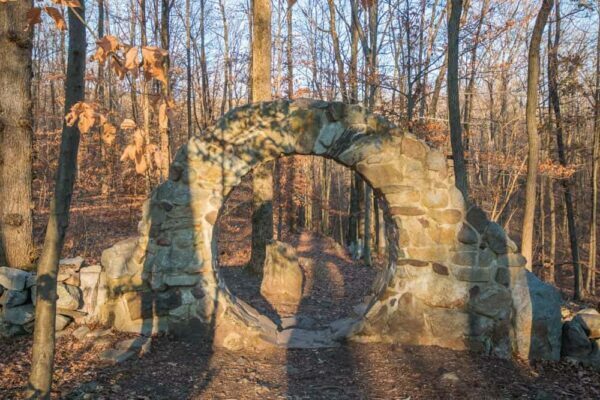 Hiking through this Celtic-inspired park is fun for all ages. 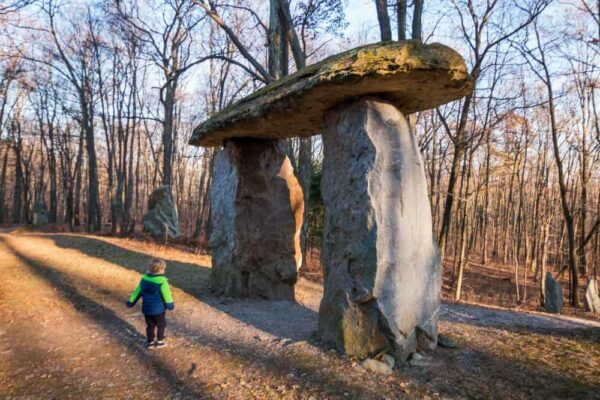 The megalith that’s often referred to as “America’s Stonehenge” is located in an open area adjacent to the small parking lot for the park. This circle of large stacked stones is quite impressive and worth taking a few minutes to explore. This area is also home to the open-air St. Oren Bell Tower which visitors can enter. 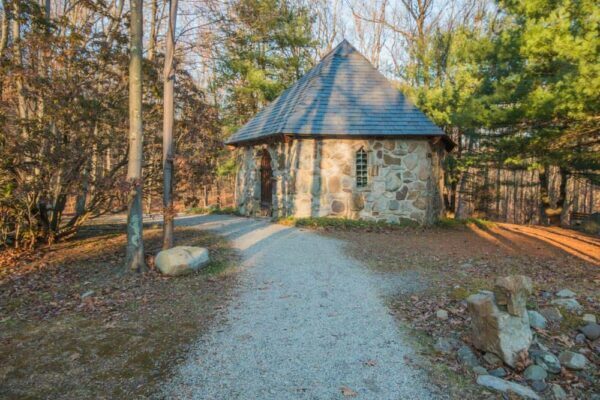 Nearby, St. Columba Chapel is the park’s only enclosed building. If the door is unlocked, take a peek inside and appreciate both the beauty and the craftsmanship that went into creating this structure. 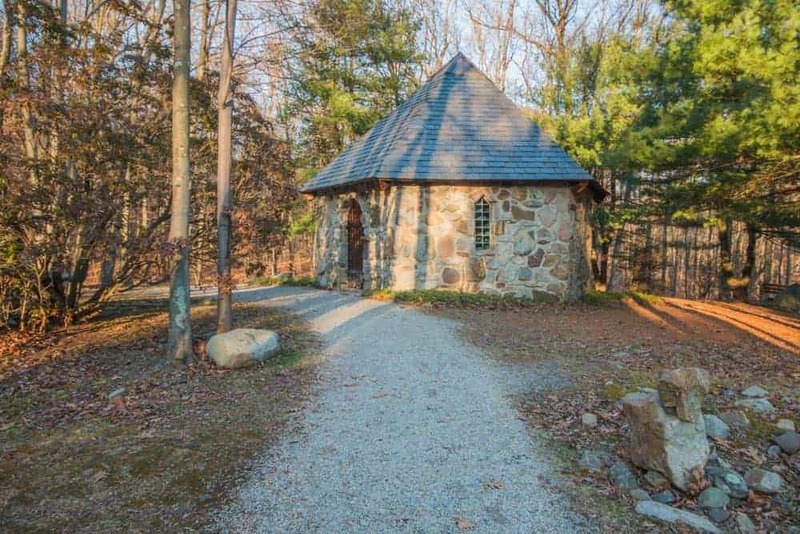 The beautiful Saint Columba Chapel at Columcille Megalith Park. The rest of the stacked stones are scattered throughout the park and have fanciful names like the Sacred Women’s Site and Mount of Dun I. While walking through the site remember that this park is not only impressive, but is also a spot for mystery and spirituality. Because of this, make sure to be respectful as you marvel at the beauty of Pennsylvania’s Stonehenge. Where is Columcille Megalith Park? Stacked stones at Columcille Megalith Park. Columcille Megalith Park is located in northern Northampton County near Bangor, PA. 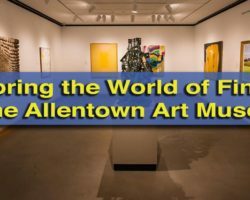 The closest large community is Stroudsburg. 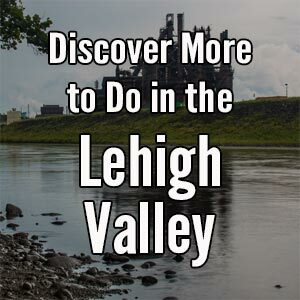 While it’s technically located in the Lehigh Valley, it’s often considered one of the top things to do in the Poconos. The entrance to the park can be found at the following coordinates: 40.926263, -75.201164. There is a small parking area adjacent to the main entrance. 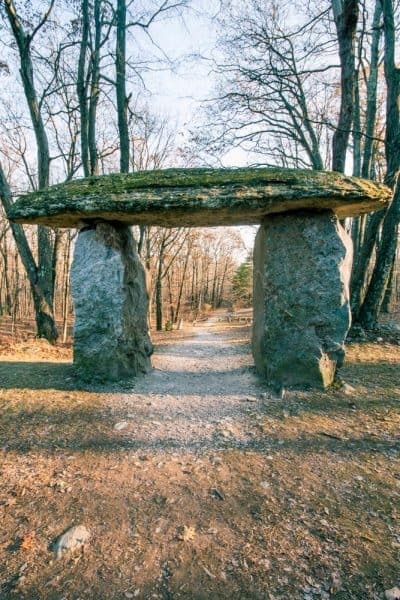 The entrance to Columcille Megalith Park. As a reminder, Columcille Megalith Park is a private park. Please be respectful of this spiritual site. The park is open daily from dawn to dusk. 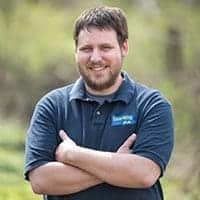 If you are looking for more things to do in the area, the park is near the Fox Gap access area for the Appalachian Trail. It’s also located near the waterfalls of Slateford Creek. 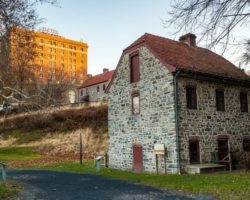 Historic Hotel Bethlehem - The region's highest-rated hotel on Trip Advisor. 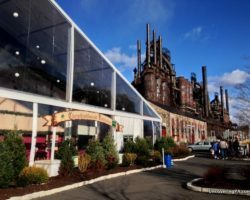 Is It Worth Visiting Bethlehem’s Christkindlmarkt? Very interesting articles this time. I used to live in the vicinity of Stony Gardens & never heard of it. Been to Ringing rocks several times.